Papell with Love: PPP - August 2014 Cutting Edge Blog Hop! 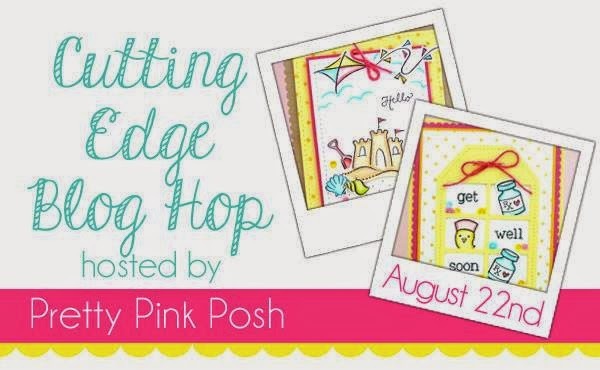 PPP - August 2014 Cutting Edge Blog Hop! Hello Everyone... very exciting day going on at Pretty Pink Posh. Lots of Fabulous Sponsors don't forget to join us! the recent release Stitched Film Strip Die. I first distress the card base using Distress ink pad in Black Soot to create the night look at the Cupcake store. I love the night look because it gives highlight on the images. I then added the Stitched Film Strip Die to case the cupcakes from Wplus9 Sweet Treats like in the cupcake store :). I also added the Scallop stitched border die from Stitched Border 1 Dies to create my awning. The awning is watercolored :). To finish off the card I add some Pretty Pink Posh Sparkling Clear in 6mm & 4mm sequins and splatters from Studio Calico in Shine. For the second card I used the circle die-cuts from Stitched Duo 2 Dies. To begin my card I first adhere all those stitched circles from the Stitched Duo 2 Dies on the panel. Next, I colored some of the circles with copics and added some clear glitters from Martha Stewart to make those stitched circles like falling snow balls. I then added the Yeti from the Lawn Fawn Yeti, Set, Go stamp set. I also added the tag and sentiment from Lawn Fawn Winter Gifts and die cut using Tag, You're it. I couldn't help it but added those cute stars from Pretty Pink Posh Nature Embellishment Kit and Sparkling Clear sequins in 6mm & 4mm to finish off my card. Don't forget to join us in the Hop! Lots of great prices from our Fabulous Sponsors. Cannot wait to see what you create. so cute! love the monster and the awesome snowballs! Oh my goodness Joni, I am swooning over these cards! At first I thought you actually sewed together the awning...almost looks like felt. Love it and the shimmer on your pretty holiday card! Oh wow, these are just so creative and fun. Great cards. Love the Yeti!!! Two fabulous cards, Joni - love both! Wow Joni these are just so fabulous. I love the scene you created on the first one. I feel a though I'm actually in a bakery. I LOVE the snowballs! The glitter is perfect! I really like the Christmas card with all the shimmer. It was very clever to use the filmstrip card and portray it as a cupcake shop, love it. Thanks for sharing. I absolutely love your fun yeti Christmas card, it made me smile big time! Great cards! Love your cupcake shop card!! Both cards are fantastic! Love the "sweet" little cupcakes and the snowballs surrounding that adorable Yeti are fabulous! Love these cards! Thanks for the creative inspiration! Oh my Gosh your cards are great! I really really love the second one and your layout with that adorable Yeti! Really, really cute cupcake card! Ohhh, and I love the glittered circles! I absolutely love both of your cards! The Yeti in the second card is just too cute! the circles on the second. 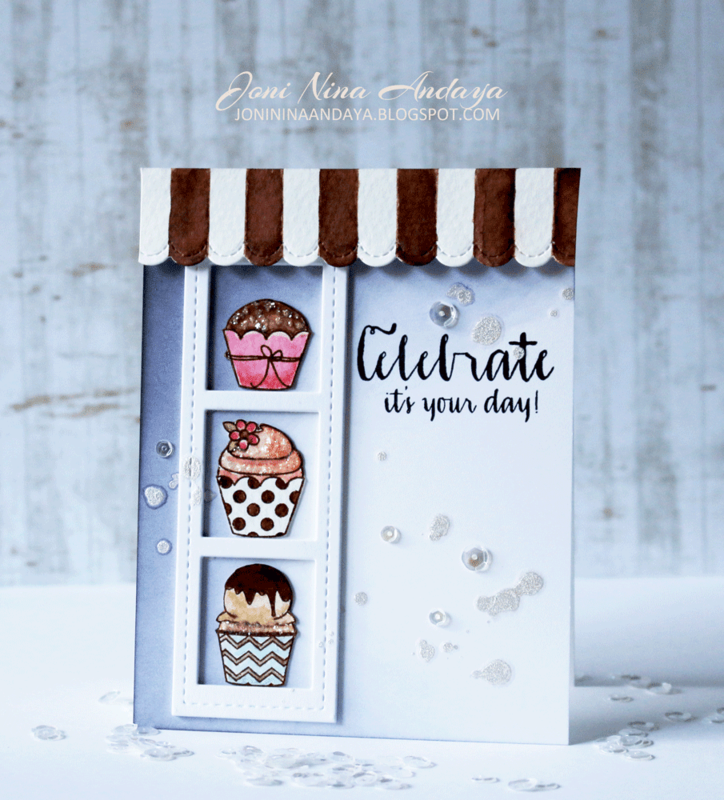 Love both cards - I especially love the way the first card looks like a bakery store front! Cute, cute, cute. I don't think I could pick a favorite between the two cards. Great ideas. Snowballs in August. Perfect! Your first card is 'yummy!' and the second oe fun. Love your snow monster! the stars are a perfect touch! These cards are so cute!!! Love the cupcake storefront idea and the partially frosted snowballs! amazing!! Adorable cards! I love your unique style - it's always fun to visit your blog! Two very lovely and creative cards. How can you not love a card that has a bake shop on the front? I love how you created a fun and non-traditional holiday card! Awesome use of these dies on both cards and the colours are beautiful! Very cool and inspiring cards. I really like how you used the circles for snowballs! Fun! I like your fun and whimsical style! All the glitter is great! Adore your first card!! So cute! Oh my gosh! These are awesome! I love all of the sparkles and how you always think outside of the box! Love both cards ....that Yeti just makes me smile! Joni your first card is so sweet!! It looks like a bakery window with a striped awning!! And your second card is just too much fun! Such original ideas here.... nice work. Fantastic, love both cards and the Yeti is adorable. They are both very cute cards. Love the way you showcased the cupcakes. Very creative. Adorable little monster and snow balls on second card & lovely color combo cupcakes with filmstrip on 1st card! both cards are so lovely, and so pretty! Very cute cards! I love the one with the Yeti! Your cards are beautiful! the monster snowball is so so fun! thanks for sharing! Both cards are cute and clever uses of the dies and both cards are fun and sure to bring a smile! Like these cards. They are so pretty & adorable! Very clever how you used that filmstrip die. Great job on the card. adorable cards...love the awning on the first. Great cards! Fantastic idea on the second card using the dies cuts how you did! Love The trim top on the first card! Darling cards!!! Love the clever awning and window you created on the first card, and your snowballs... so creative and fun! I love the "awning" that you created. So adorable. Love your cards! I love how you used the circles for the background for that adorable monster. Thanks for sharing. Super cute - love the snowballs and monster card - such a fun christmas card idea. Both of your cards are so fun! Cute, cute cards, Joni! Love your little cupcake shop and that Yeti stole my heart! Brilliant idea with the snowballs and with the yeti stamp, I think that it is the cutest winter card that I have seen! Thanks for sharing! Love the colors in the holiday card!!! Really gorgeous coloring! Both cards are fab! This is such a fun card!!!! I love it! The first card looks like a bakery shop window! The second one is so fun and adorable. WOW! These are amazing, Joni!!! Love! Both of these cards are amazing! I love the first one is just gorgeous with the way you shaded and with the cute awning. The second card is so cute! Super cute cards - love the cupcakes and the yeti. Fabulous. The awning is perfect on the first card. Oh these cards are too cute... Like the sort of ombre look on both cards... That yeti is sooo adorable! OMG, your cards are simply amazing! Both SOOOO gorgeous! LOVE the colors and the sparkle!!! Love how you create the awning with the scallop die. Great idea! Love both of your cards! Reverse Confetti - August Creative Blog Hop! 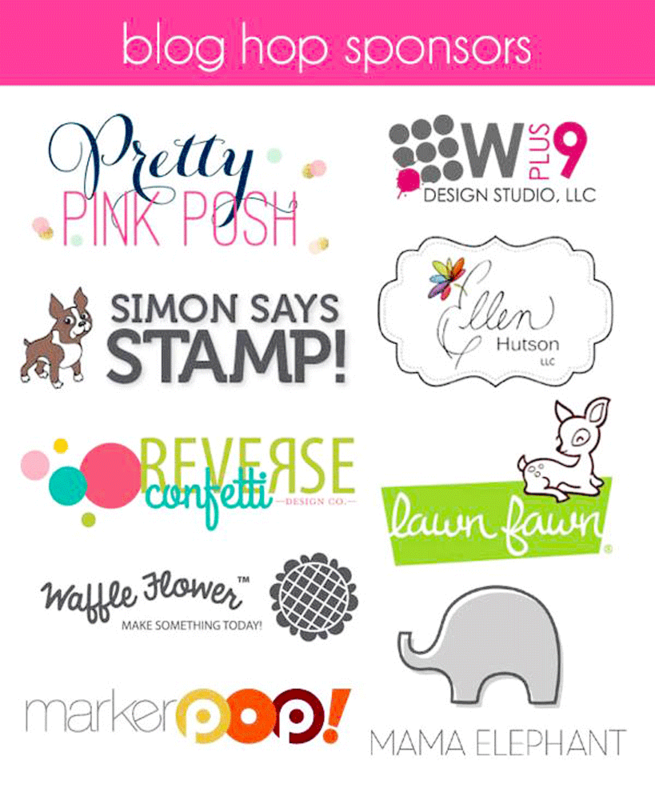 Pretty Pink Posh - August New Products Blog Hop!